Financial model color formatting, which refers to the way the numbers in the financial modelWhat is a Financial Model?A financial model is a representation of a company’s past and future performance based on it's assets & operations. Find out: what is a financial model? is displayed, helps keep the visual element of the financial model clean and easy to read for the user. As stated previously, the three factors of a good financial modelWhat makes a good financial model?What makes a good financial model? This quick guide will highlight the attributes of a "good" financial model in Excel including best practices, tips and are consistency, efficiency, and clarity. Proper formatting aids in all three of these. Coloring the text and contents of cells as such helps the user understand the different types of data working within the model, as well as the flow between the different pieces of data. For example, blue text inputs will likely not have any predecessor data, so it becomes a logical starting point to follow formula paths. 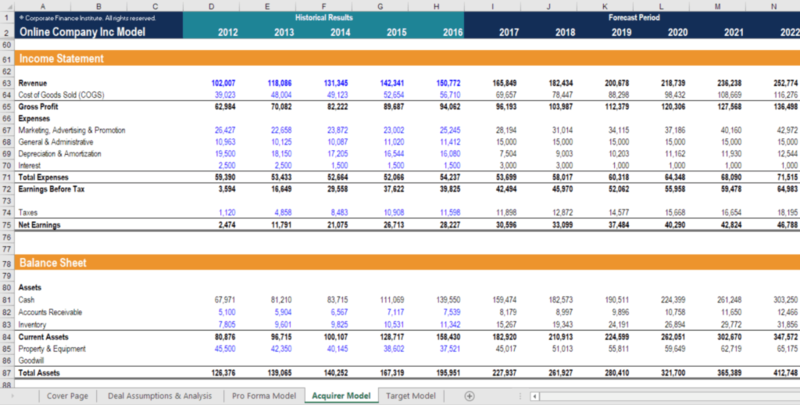 Examples of financial model color formatting in practice can be found in CFI’s financial modeling courses. Excel has a valuable feature known as conditional formatting. This lets the user set rules or thresholds for certain cells. If these rules are met or the thresholds are triggered, Excel will format the cells in a certain way that the user has set. This becomes useful for pointing out certain pieces of data within the model. For example, if it is important to point out when a company incurs a loss in a certain period, the user can set conditional formatting for the net incomeNet IncomeNet Income is a key line item, not only in the income statement, but in all three core financial statements. While it is arrived at through the income statement, the net profit is also used in both the balance sheet and the cash flow statement. cells in a model. The rule will be set to check whether the cell’s value is less than or equal to 0, and if it is, the cell can have a special background shading. This conditional formatting allows users to quickly spot any red flags within the model. A great thing about conditional formatting is it bestows a large amount of creativity to the user in how they implement such formatting. However, it is important to remember not to get carried away with conditional formatting. Ideally, it should only be used to pinpoint or highlight important information, as having too many colors appearing within a spreadsheet may detract from the clarity of the overall model. Each of these different styles helps the user of the model clearly see the information contained in it. Learn more in CFI’s Financial Modeling Courses. Thank you for reading this guide to financial model color formatting. CFI is the official provider of the Financial Modeling and Valuation Analyst (FMVA) designationFMVA™ CertificationThe Financial Modeling & Valueation Analyst (FMVA)™ accreditation is a global standard for financial analysts that covers finance, accounting, financial modeling, valuation, budgeting, forecasting, presentations, and strategy. .
Financial Model Formatting: NumbersFinancial Model Formatting: Numbers​Financial model number formatting improves the clarity, efficiency, and consistency of a financial model is to utilize consistent decimal formatting.